One decision that all businesses must face eventually is whether to use employees as their in-house janitorial staff or use an outside cleaning service. The decision is an important one because every business seeks to project a professional image to its clients and visitors. And while it may appear that using an in-house staff is more efficient and cost saving, the opposite is actually true. Since we know your goal as a business owner is to make your company more efficient, we present you with see five reasons you should outsource your company’s janitorial services rather than hiring an employee to clean your office. Outsourcing your cleaning services means greater availability: With regular, full-time employees there are the issues of holidays, vacations and other attendance related events that can delay cleaning services. By contacting an outside cleaning company, you will be sure to have someone available when your regular crew is not. Outsourcing janitorial services is more cost-effective: An in-house cleaning staff must be trained and equipment purchased and maintained for their use. This cost is passed on to your company in this case. With outsourced cleaning services these costs are covered by the commercial cleaning service. Thus, you save money that can be rolled back into your business. Some outsourced cleaning companies are eco-friendly: Protecting the environment is or at least should be a priority with many businesses today. Thus, many companies, like ours have implemented “green cleaning practices.” We do not use harmful chemicals that will damage the environmental or that threaten workplace health and safety. Some outsourced cleaning companies provide additional services: Unlike an in-house cleaning crew, our company has a wide variety of services we provide such as HEPA vacuum cleaning services in Riverside, day porter services, post construction clean up, interior light maintenance and more. Outside cleaning companies have greater experience than in house teams: It is our business to stay up-to-date on the most innovative and effective cleaning equipment. In fact, we often have equipment few companies own or have access to. In short, when it comes to your business and its janitorial needs outsourcing is more efficient, more cost effective and just makes more sense. 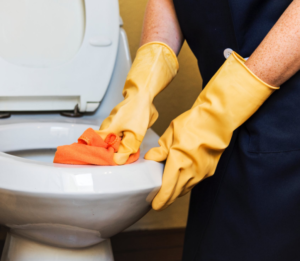 Our janitorial services in the Inland Empire have a staff that is trained in all the latest techniques to make your office spotless and germ free.